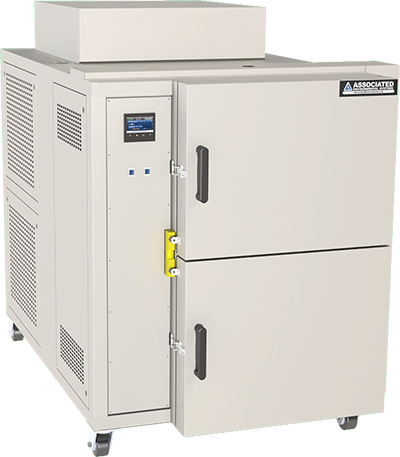 Our SM-05 is a thermal shock test chamber with a 5 cubic foot - 142 liters working volume, external dimensions of 54"W x 66"D x 61"H (1372W x 1676D x 1549H mm) with temperature range from as low as -85°F / -65°C. SM series is both MIL-STD-202H and MIL-STD-883K compliant. 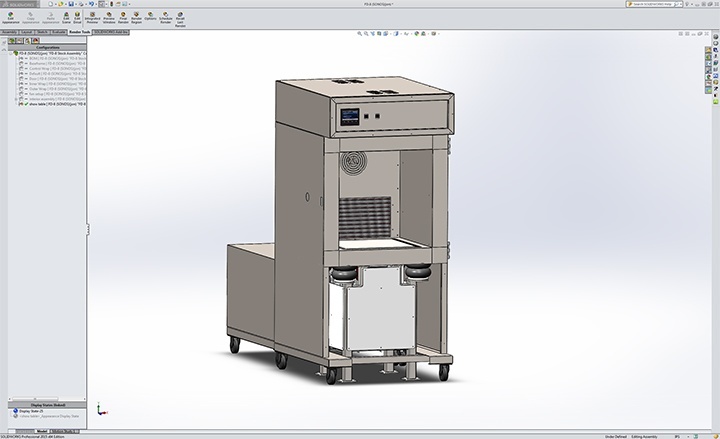 The SM thermal shock test chamber series features a pneumatic basket to quickly and autonomously transfer test items from the refrigeration compartment to the thermal compartment and vice-versa. 80-100 PSI of compressed air is required for cylinder operation. As an option, it is possible to add a third middle compartment to the thermal shock test chamber, which exposes the test item to ambient temperature air to test environmentally normal conditions. Customers require the ability to reliably test as much product as possible in as little time as possible. 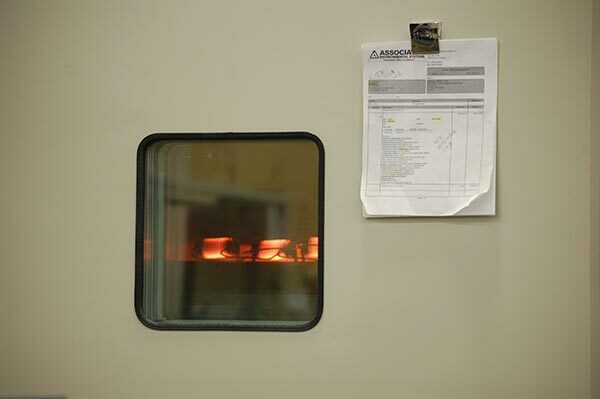 AES standard cascade refrigeration systems have the fastest standard change rates of any environmental test chamber manufacturer, with average pull down times of 2.5°C/ minute and average ramp rates of 4.4°C/ minute. AES chambers allow you to maximize product testing efficiency without sacrificing quality. All test chambers incorporate non-magnetic welded type 304 stainless steel inner chambers, a cold-rolled steel, powder coated exterior, efficient low "K" factor thermal insulation and direct drive-shaft powered forced air circulation along with open wire nichrome resistance elements generating ultimate functionality while maintaining a pleasant laboratory appearance. State-of-the-art regulation techniques result in high accuracy and long term stability. AES heating systems are all-electric and pass air over fast-response low watt density resistance heaters with a ceramic core insuring a long reliable life with no down time. The combination of airflow, instrument response and these fast reacting heaters give very accurate and straight-line control of temperatures. 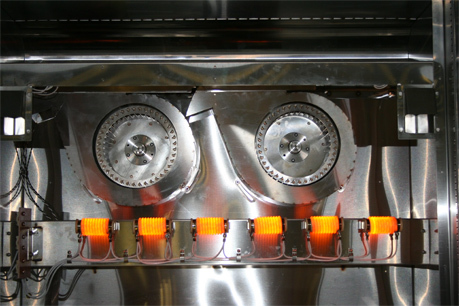 Our heating systems support temperatures upwards of 180°C (356°F) and heaters may be controlled independently or in unison. 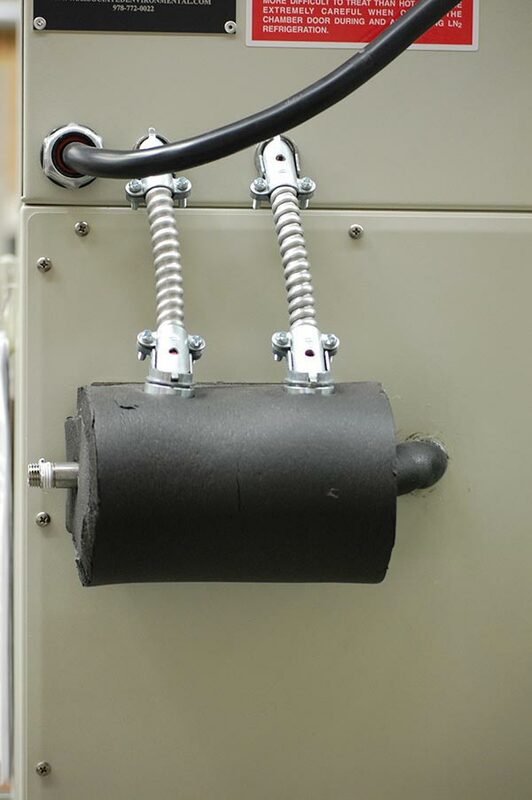 Heating systems are located in a plenum so that test items are not subject to direct radiation. 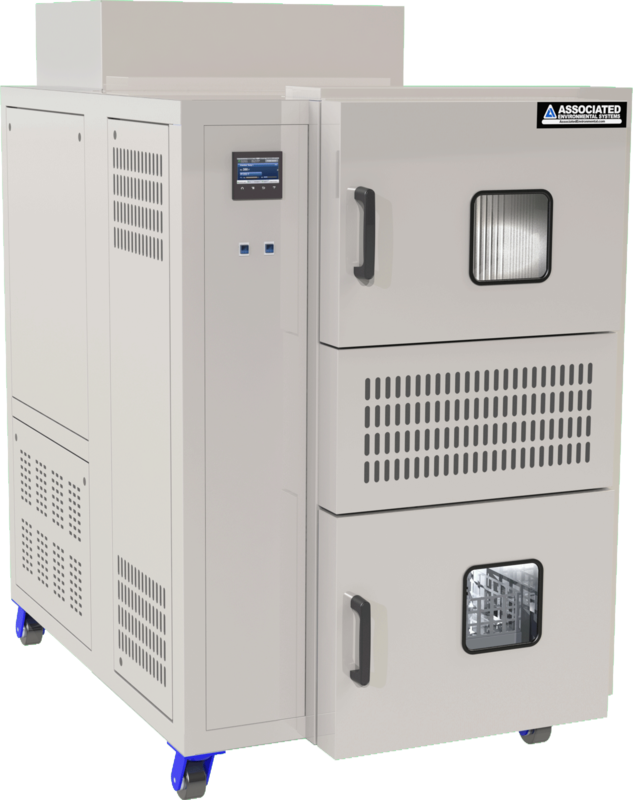 AES test chambers are either built with a single stage, self-contained mechanical refrigeration system [-37°C (-35°F)], or a two-stage, cascade mechanical refrigeration system [-65°C (-85°F)]. 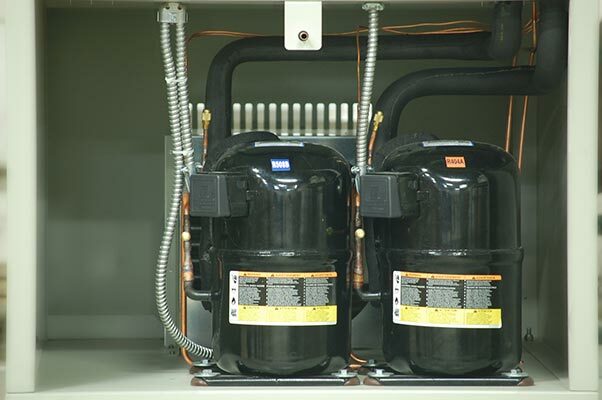 Depending on the size of the cooling system needed, more than one compressor will be included, or a small scroll compressor will be used to save space. 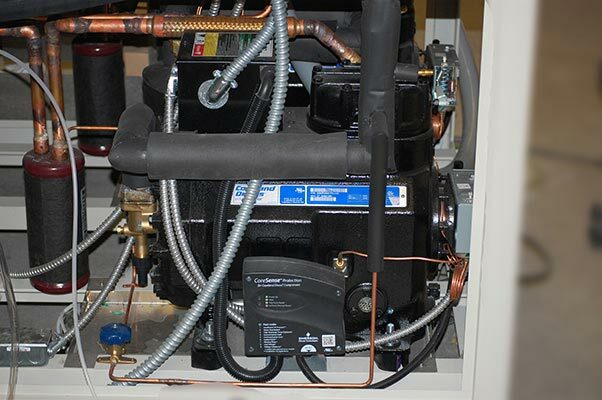 Both refrigeration systems also come with an option for water cooling. Air cooling will heat up the room that the test chamber is located in, is usually less power efficient, slows the pull down times of the chamber, and needs more space, but costs less and is simpler. The water cooling option does not heat up the room it is located in, is more power efficient, and has a smaller area compared to the air cooled option, but is more complicated, costs more, and needs a water supply. 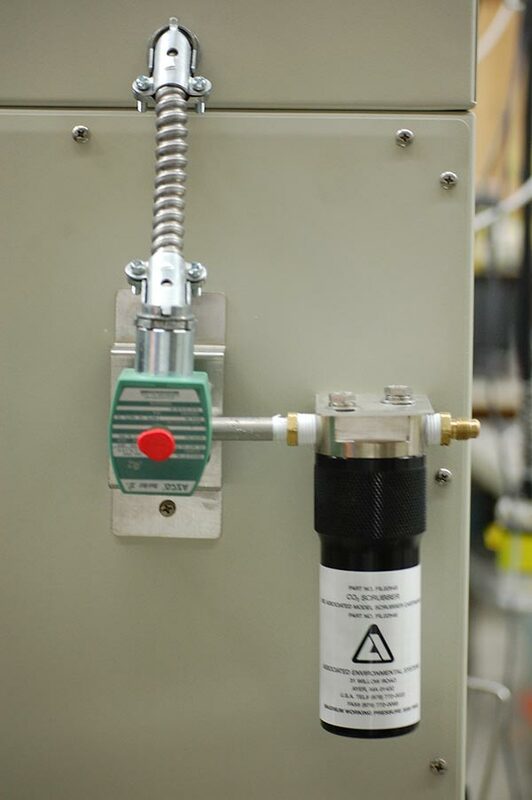 Via an endothermic process, directly injected liquid carbon dioxide instantly drops the temperature of the test chamber interior, ideal for stress tests and efficient thermal dissipation. 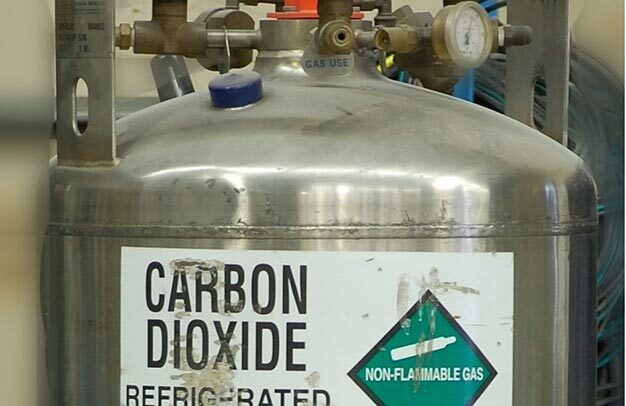 CO2 can lower the chamber's internal temperature almost instantaneously to -73°C (-100°F). Liquid CO2 is available to customers in either a bulk system stand-alone tank, or a cylindrical system which stores much smaller amounts in multiple attached vessels. A dependable filtering system designed to eliminate contamination caused by moisture, oil and dirt in bulk or bottled liquid CO2 supplies. Suitable for both 1000 psi and 300 psi service and assure pure CO2 at valves and metering orifices, completely eliminating problems of clogging and erratic operation. Included with the cylinder based CO2 cooling system, the manifold system is designed to regulate and monitor the vaporized gas coming from cryogenic cylinders. This system may be used to test to the MLC-6 specification. Included with the bulk order CO2 cooling system, the tank to test chamber hose provides safe and effective delivery of liquid CO2 to the chamber interior. This system may be used to test to the DAK-6 specification. This larger reserve system has a higher initial cost but then offers a much lower per pound CO2 cost to customers and is recommended for long duration testing or multi-chamber operation. The cylindrical system stores much smaller amounts of CO2 in attached vessels, stored at room temperature and 1000 psi. This option is recommended for short duration testing or long term testing in smaller test chamber sizes. 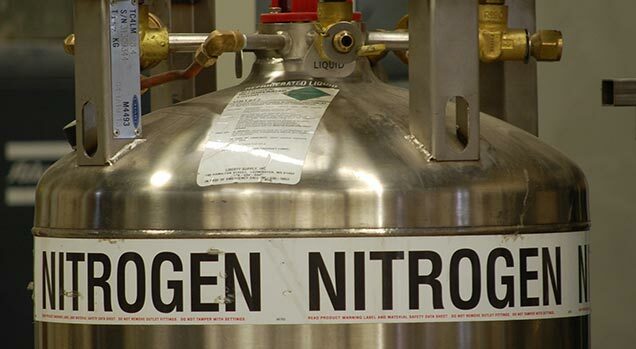 Liquid nitrogen is directly injected into the test chamber to both expand achievable temperature ranges and raise the temperature change rate. Upon contact with the air inside the test chamber, following the same thermodynamic principle as the CO2 boost, liquid nitrogen can rapidly decrease the interior chamber temperature. Liquid N2 boost can quickly lower the temperature to a cryogenic temperature of -185°C (-300°F). Unlike CO2 which has a boiling point of -57°C (-70.6°F), liquid N2 has a boiling point of -196°C (-320.8°F) and will therefore have a much faster cooling and higher temperature change rate. Liquid N2 cooling options are available in 100 liter portable dewars or bulk storage. 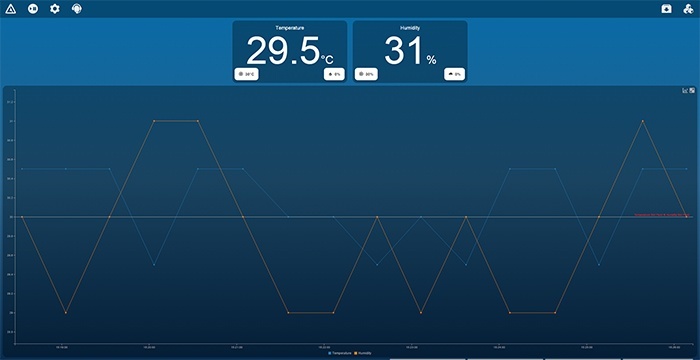 Digital chart recorders allow users to escape the limitations of pen and paper data recorders and provide a way to instantly monitor and store valuable testing data. This model CANNOT fit through a standard 34" wide doorway. 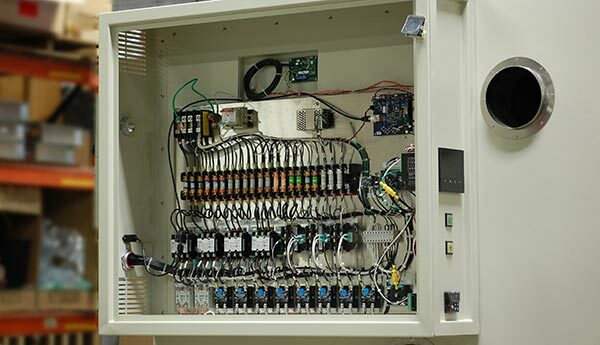 AES can make modifications to allow for a modular assembly on-site, overcoming most facility issues. Casters and floor stands may be applied to any test chamber series except walk-ins, on request, to optimize transportation.